With Holidays fast approaching, it’s time to gather together some fast and easy appetizer recipes. Here are a list of great sauces for bison and elk mini meatballs. Visit our blog often. We have more holiday recipes for bison, elk, wild boar and even ostrich uploaded every day. First Prepare meatballs and cook in a heavy skillet. 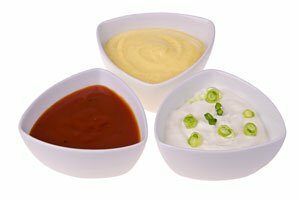 Method 2: Serve the sauce on the side in a small bowl for dipping. Mix all ingredients in a sauce pan. Heat over medium heat, stirring constantly. After the mixture is heated through, add meatballs to the pan and mix with sauce. Heat for about 5 minutes over medium heat until heated through. Serve warm with tooth picks. 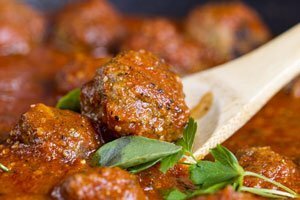 These cocktail elk (venison) meatballs are fast, easy and delicious. Serving up some venison sure spices up these holiday parties! They’re just a little bit unusual and taste great! They’re great crowd pleasers. Kids and adults love them. They are so easy to make, easy to eat as finger foods during all your holiday get togethers. In a large bowl, combine the chopped spanish onion , instant rice, salt and pepper mix with the venison. Shape into 1″ balls. Place in a greased 8-in. square baking dish. Combine the remaining ingredients; pour over meatballs. Try these meatballs with a variety of sauces. Double the recipe for a larger crowd. Mini-sized ground bison or elk meatballs are seasoned with a little minced onion and garlic, fresh parsley and Worcestershire sauce,They are tenderized with egg, milk and bread crumbs. Yield about 3 dozen mini meatballs. Form 1″ balls and cook in a large nonstick skillet over medium-high heat, turning or tossing frequently to brown all surfaces.